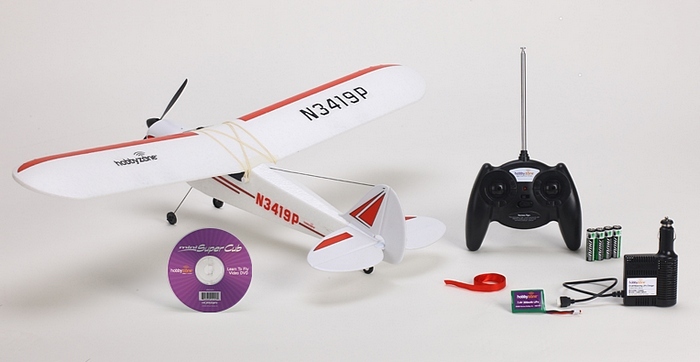 The Hobbyzone Mini Super cub is a smaller version of a very popular model. Lots of useful information for those interested in this mini beginner RC Plane. 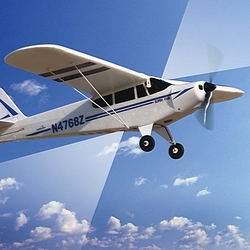 The Min Super Cub is a conventional, high wing beginner RC airplane. It comes completely assembled and ready to fly. This is a 3-channel model that uses a 27 MHz radio. You must ensure that there is no one else on your frequency, before you switch on the transmitter. Two transmitters, on the same frequency equals two crashed airplanes! Note that 6 different frequencies are available. (ACT) is built in and can be switched on and off. Two sensors are mounted as shown in the photograph and can sense the attitude of the aircraft. If there is enough altitude, the system will return an aircraft to an upright and stable flight position, after the flyer has lost model orientation. This feature can save many a beginner from a crashed and maybe damaged airplane! Completely finished airframe, manufactured from Z-foam. 3-channel RC transmitter on 27 MHz. Everything is included. Maybe the only thing to consider buying would be an extra Li-Po, to swap out when the first one is used, thus reducing wait time between flights. This video, by Hobbyzone, shows some nice flying shots and does show the ACT operating. The Hobbyzone Mini Super Cub is very easy to fly and very forgiving-just what is required for the novice flyer! As long as there is enough altitude, then the ACT works well. Watch the CD to get full information. Completely finished and ready to fly. Everything is included-nothing else to buy. Simple to fly and very forgiving. Wing is held on with rubber bands-very forgiving and saves a lot of damage in hard landings. Excellent price for a true hobby grade airplane-this is not a toy! 27 MHz system. Check for other flyers before switching on transmitter! Spring centered throttle stick is weird! -Should be conventional ratchet style. Small wheels means grass take-offs impossible. The majority of reviews of the Hobbyzone Mini Super Cub were very positive. The majority of complaints were regarding the ACT. Remember that this system does need height to allow the airplane to recover. It acts like an automatic pilot and tries to bring the plane into a stable, level flight condition. Trying to learn to fly on your own, can be done, with an airplane such as this Super Cub. However it is mush easier if you can find an experienced flyer to help and guide you through these first steps. Time with a good flight simulator is also very useful. 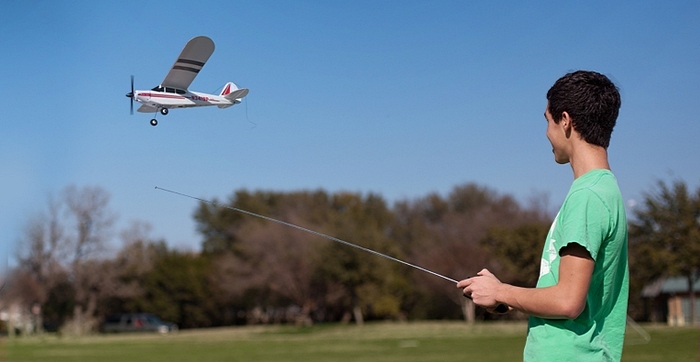 Hobbyzone have a wide range of similar RC airplanes. Click here for more details.